This document describes how to use the version of WinSCP to copy or transfer, files from one computer to another over the Internet. WinSCP uses sftp (secure file transfer protocol). 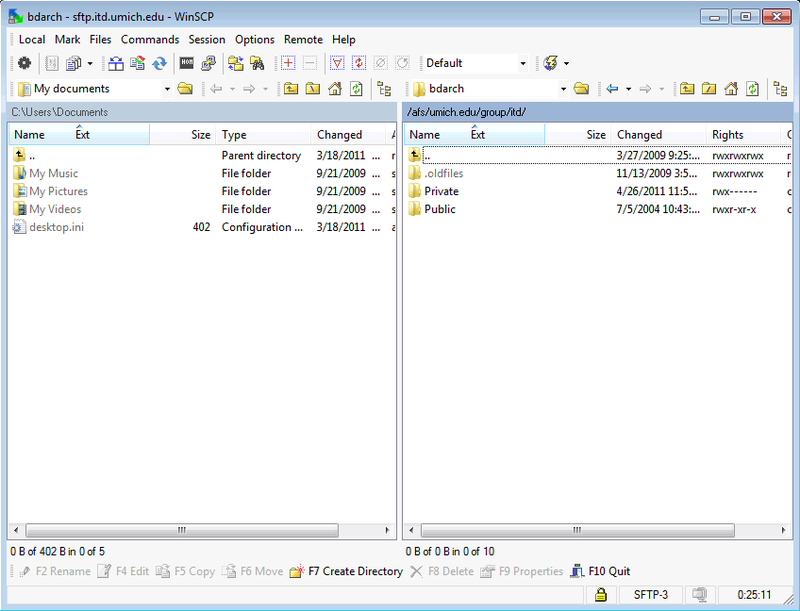 Members of the U-M community can download WinSCP (bundled with PuTTY). ITS provides a number of shortcuts to make it easier for you to open secure file-transfer connections to popular host computers at U-M. (A "host computer" is one that allows other computers to connect to it; it "hosts" connections from other computers.) Here's how to use the shortcuts. The UM Internet Access Kit folder is included in the download of WinSCP and PuTTY. The shortcuts should be inside this folder. Double-click ITS Home Directory (file transfer) to open a connection you can use to transfer files to and from your home directory. WinSCP opens. When you first attempt to connect to a new server, you'll get a warning message. Click Yes to continue. In the Username: text box, type your uniqname and click OK to continue. In the Password: box, type your password and click OK to continue. For your AFS Home Directory, this password is your UMICH (Level-1) password. A window showing your local computer on the left and your home directory on the right opens. You are now ready to transfer files. Transfer files by dragging their icons from one side of the window to the other . You can copy files from your local computer to your AFS home directory and vice versa. On the home directory (remote) side of your window, click a file to select it. From the Files menu, select Delete. In the Confirm dialog box, click OK. The file is deleted. From the Files menu, select Rename. The file name becomes editable. Make whatever changes to the file name you wish. Click anywhere outside the file name to save the changes. In the top right corner of the WinSCP file transfer window, click the red X. In the Confirm dialog box, click OK. This closes your connection to the host computer, and closes the window. Open WinSCP for file transfer by double-clicking the WinSCP icon. A WinSCP Login dialog box opens. In the Host Name box, type the host computer's address. In the Password box, type your password. (For most U-M computers, use your UMICH (Level-1) password. CAUTION! Use your uniqname and UMICH (Level-1) password with WinSCP only when connecting to U-M hosts. Do not use them with non-U-M hosts. Some host computers at U-M—such as those run by individual schools, colleges, or departments—may require different user IDs and passwords.